Cooker Setup? -- First of all, and this should be obvious, you need a pizza stone if you want the wood-fired oven effect. The stone serves to provide significant and sudden heat to the dough to aid in its rise as it cooks. The stone is also porous so it absorbs moisture from the pizza dough, which in turn produces a crisp crust. Buy a plate setter. You can see photos of the plate setter in our Ceramic FAQ. Place fire bricks on the grid and the pizza stone on the fire bricks. You can see a firebrick setup in the photo to the right. You would just place your pizza stone on the firebricks. Make a raised grid and place the stone on the grid. Two stones would be better. You can see how to make a raised grid in our Ceramic FAQ. Third, you want to add ceramic mass so that the direct intense heat from the fire isn't immediately transferred to the stone and to the pie. The plate setter or the fire bricks will accomplish this. However, if you don't have either, doubling up on the pizza stones will help. How Big Is Your Stone? -- We own a large, a medium and small Big Green Eggs. We find that the 16-inch stone from Crate and Barrel is the perfect size in a large. Click on the photo to the right to see a larger image of our setup with the 16" stone in the large Egg. It leaves enough room around the edge for circulation of air and heat, while being large enough to cook a 14" pie from our local pizza place. In general, it seems that leaving a 1 to 1.5 inch gap around the perimeter of the stone is sufficient. As for the medium Egg, there is a plate setter available for the medium Egg. Also, Big Green Egg sells a 14-inch pizza stone that is perfectly sized for the medium. We have used the medium plate setter and a 14-inch stone in our medium Egg and there is plenty of space around the stone to allow air to circulate and create a fire hot enough to cook pizza. 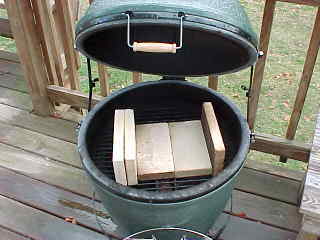 And finally, for the small Eggs the 12-inch stone sold by BGE is the perfect size for cooking on the small. There is now a plate setter for the small Egg, or you can make a raised grid for your small (see our Ceramic FAQ for details) and put your stone on that. If you find that you need more ceramic between the fire and the pie, you could always use two stones. Another option for the small is to use the rather ingenious and terribly useful Grate Mates to hold your pizza stone. If you have installed your gasket so gasket material protrudes into the cooker instead of being flush with the inside surface of the cooker, the gasket that is actually inside the cooker will burn/melt. If you have a poorly fitting lid and a gap between the top and bottom, hot air will escape the cooker through the gap and this can potentially burn/melt your gasket. If you open the lid and allow a mini-flashback to occur, this will also burn/melt your gasket. How Tough Is Your Stone? 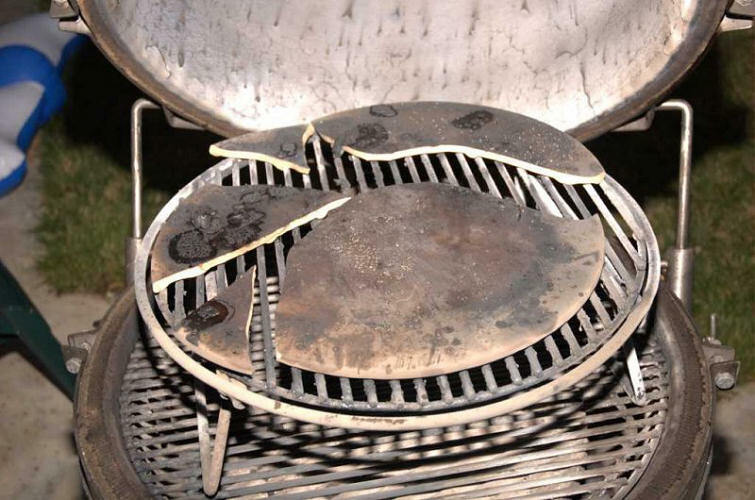 -- There are a lot of stories about pizza stones cracking when subjected to high heat. The pizza stones sold by Big Green Egg are plenty tough and will not crack. The stone that we bought from Crate and Barrel has withstood the test of time, also. However, in discussion forums one brand continually comes up as a problem stone that cracks. Whatever you do, do not use a pizza stone from The Pampered Chef in your Egg. For whatever reason, it cannot take the heat and is almost guaranteed to crack. If you can't get a BGE stone, or a stone sold by the manufacturer or your ceramic cooker, look for a thick and heavy stone. "This is what happened to my Pampered Chef Pizza stone last Friday when doing pizza's at 700 on my K7. I had it on the upper rack with the Kamado stone on the lower-rack (not the main grill like some do). Anyway, I did 2 pizzas and the last one did it (which was when the heat was the highest)." "Pampered Chef Pizza Stone after ~5-6 uses at temps up to 700. Those pieces are where they lay after the stone exploded. I did not move those pieces." Seasoning Your Pizza Stone -- We were surprised to get asked this question, as we thought it was obvious that you should never season a pizza stone with oil like you would cast iron. Half the point of baking on a stone is that the stone is porous and will absorb moisture from the dough and help to produce a crisp crust. If you pre-heat the stone and use a bit of corn meal, you will never have a problem with the dough sticking to the stone. On the other hand, we did learn something in that it turns out that there are baking stones sold which are not made from ceramic. The manufacturers of these stones apparently do recommend that you season the stone. So all we can say is that if you use a ceramic stone, do not season it. If you use a stone made from something else, follow the manufacturer's instructions. Smoke Or No Smoke? -- This is a matter of taste. I love smoke flavor in my pizzas. I throw a healthy handful of soaked chips onto the hot fire, wait for the smoke to begin, and then put the pie in the cooker. Since the pie is only going to cook for a few minutes, you need as much smoke as possible if you want the pie to absorb it. On the other hand, some people don't like smoke in their pizza, so don't use smoke if you don't like smoke. What Temperature To Use? -- This depends on the type of dough you are using. Many people report good results using Spin's recipe for dough (found here) and cooking at 600-650 degrees. I buy unbaked pies from a local pizza joint and have found that 550 degrees is perfect for these pies. I have also tried baking DiGiorno frozen pies and have found that using the temperature on the box, 450 degrees, works best. In general, you can use these guidelines as a starting point and then adjust as you gain experience. Preheat The Stone? -- In order to avoid cracking your pizza stone, you should put your stone into the cooker when the cooker is cool. Do NOT place a cold stone in a 650 degree cooker! Some stones may be able to withstand the thermal shock, but many (most?) will not and they will crack. You want the stone to heat up slowly as the cooker heats up. The second method may be the way to go if you are going to cook just one pie, since as the stone gets ever hotter, you will find your crust burning. (You may be able to control this somewhat with the damp rag trick. See the next section.) On the other hand, if you want to cook multiple pies, you need a stable temperature for the stone. You don't want the first pie to turn out perfect, but have every pie after that have progressively more burnt crust as the stone gets hotter and hotter. In this case, you need to seek a temperature that gets your crust done the way you like it, but also gets the toppings sufficiently cooked and the cheese sufficiently melted. Personally, we like to know we have the stone at a stable temperature, so we preheat the cooker to the cooking temperature and then allow 30 minutes for the stone to preheat. Preheat The Cooker? -- Well, we just told you that we preheat the stone. So, of course our cooker is going to be preheated. If you don't preheat your stone, you need to preheat the cooker. You want the ceramic to be hot in order to help cook the toppings. All that hot ceramic surrounding the pie will help it cook better, so make sure your cooker, not just the air inside it, is nice and hot! Sauce? -- Needless to say, there must be a million recipes for sauce, and a million bottled sauces you can use from the store. Well, here is our simple sauce to use. This is a chunky sauce that goes well with blobs of Ile de Paris herbed goat cheese, chicken and freshly chopped oregano or basil over the top. If you like a smooth sauce, use your stick blender to puree it. This makes enough sauce for 1 12-inch pizza. Heat the oil in a 1-1/2 qt sauce pan. Cook the onion and garlic until softened and translucent, about 3 minutes. Stir as necessary. Add tomatoes, crushing lightly with your hands as you add them. Be sure to add the juice, too. Strip the leaves of oregano from the stem and then chop roughly. Add the oregano and the sugar. Simmer, stirring occasionally for about 20-30 minutes, until thickened. Add salt and pepper to taste. This makes enough dough for 2 12-inch pizzas. Burnt Crust? -- Assuming that you are using a temperature that is necessary to get the toppings done, you can prevent burnt crusts one of two ways. If necessary, you can always put the pie on the stone and bake it before the stone gets too hot. Of course, this precludes cooking multiple pies. Another trick that is used in pizza restaurants is to wipe the stone with a damp rag before putting the first pie on it in order to cool the stone. The first pie will aid in cooling the stone more. Then, as long as you keep putting fresh pies on the stone and don't allow the stone to heat up in between pies, you may be able to keep the stone temperature down to an acceptable temperature. If you should have to delay between pies, just give the stone another wipe with the damp rag. Toppings Not Done? -- You need to get the top of the cooker as hot as possible without burning the crust on a too-hot stone. The general advice here is to leave the bottom vent wide open and to control the temperature with the daisy wheel. This prevents the hot air from escaping through the top vent any faster than necessary. And of course we have already told you that the cooker should be preheated. This will help cook those toppings faster. Frozen Pizza? 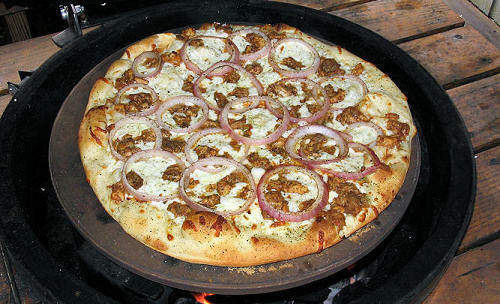 -- The only frozen pies that I've personally tried are DiGiorno. In general, it seems that the best advice with frozen pizza is to follow the directions/temperature on the box. I have achieved very acceptable results simply following the temperature on the box. Spin recommends putting the pie on some sort of grid, and placing the grid on the pizza stone. I've not tried it, but it is a good excuse to try cooking more pizza! So why does a DiGiorno pie need a lower temperature?. You want my opinion? It all goes back to chocolate chip cookies and Alton Brown. Frozen pies like DiGiorno rely on yeast for their dough to rise. They use a baking powder that activates at low temperature. However, I think there may be another factor involved. If you watched the "Three Chips For Sister Marsha" episode of Good Eats (officially listed in The Canon as episode EA1C05), you'll remember that there are low protein flours and high protein flours. Bread flour is high in protein, while cake flour is low in protein. The protein in bread flour holds on to the moisture in the dough, while the moisture in dough made with low protein cake flour is released and turns to steam. This steam can then be relied upon to provide lift and to aid in making the dough rise. I think DiGiorno pies and the like use this technique to aid their dough in rising. If all that moisture is being released from the dough and converted to steam, the crust will burn at a lower temperature than if the moisture is retained in the dough. Hence, DiGiorno crusts burn at lower temperatures that freshly made dough using yeast and bread flour. As my sister says, "that's my story, and I'm sticking to it." Grilled Pizza? -- Yes, grilled pizza! Many people, when they first hear of grilling pizza, think that the pizza dough will somehow fall between the grate and into the fire. Or perhaps sag between the grates so badly that you will end up with a pie like a cattle guard. Well, it works just fine and grilled pizza is another style of pizza you might want to try. The crust turns out crispy top and bottom, and of course, you get the wood-fired oven result that is hard to beat! Grilled pizzas tend to go quickly and require a bit more work during the cook (you grill one side then remove it from the grill, add toppings to the grilled side and the return the pie to the cooker) so you need to be sure that you have everything ready to go when you start cooking. When grilling pizza, you will be grilling more than baking, so you don't need to be worried so much about preheating the cooker and attaining a specific temperature. Not unlike cooking paella you want to build a fire that will do the job. What we have found to work well is a uniform fire with no draft feeding it and a grid about 8 to 9 inches above the fire. On a large Big Green Egg, we accomplish this by loading the firebox to the top and using a raised grid that is even with the cooker's opening. We dump about half to three-quarters of a chimney of burning Cowboy charcoal on top of the prepared fire and allow it to burn with the bottom vent closed and the dome open. (You can close the lid and set the top and bottom vents wide open to get the charcoal started. However, once the cooker is at 400 degrees or so, open the dome and completely close the bottom vent. The fire will be more than hot enough without a draft. Allow the fire to continue spreading until you have a uniform bed of burning charcoal.) On a Komodo Kamado O.T.B. cooker, we do the same thing (charcoal up to the top of the firebox, dump burning Cowboy on top) and use the upper grid for cooking. The dough rounds can be prepared in advance and stacked between layers of parchment paper. When the grill is ready, you can if necessary, give them one last rolling or stretching. Grill one or more dough rounds on one side for about 2-3 minutes until the tops are covered with bubbles (you can pierce larger bubbles with a paring knife) and the bottom sides have grill marks and are suitably browned. You can check them with a pair of tongs, lifting the rounds to check the under side. When cone, remove the rounds to a work surface, grilled side up. Brush the grilled side with some olive oil, add the toppings and then return the pie to the cooker. Close the lid of your cooker and cook for 3-5 minutes until the bottom is again suitably browned and the cheese has melted on the top. Serve as soon as possible. The top of the dough round will look like this when you are getting close. You can pop that big bubble with a paring knife. This is what the bottom looks like when it is ready to turn and add the toppings. Two pies that have had the toppings added cooking on a Komodo Kamado O.T.B. cooker. Cleaning Your Pizza Stone -- You can use a kitchen scraper to scrape off burned-on bits of crust or toppings. If you want to clean the stone a bit more thoroughly, you can use a clean damp rag to wipe it down. However, do not use soap on your pizza stone. The stone is ceramic and ceramic is porous. Soap can soak into the stone and then be released when you cook with it. There is no need to use soap. Pizza stones are supposed to get discolored with use, so don't try to scrub them and get them spotless.